We’re halfway through winter, which means one thing: Spring is just around the corner! Well, not quite around the corner — it’s not Valentine’s Day or anything — but we’re finally inching closer to days that it’s not so cold we have to wear a double-digit number of layers just to keep somewhat warm. While we know that the temps aren’t magically going to catapult overnight, we’re excited for it to finally start inching away from “can’t feel my toes” to “wow, it’s not miserable out there” again. However — pending the groundhog’s forecast next month — we still have a couple more weeks of chill to go before pulling the sundresses and sandals out of storage. Any true fashionista knows that the best part about looming temperature shifts and seasonal changes is whipping her transitional wardrobe into gear and luckily, there’s a sale that’ll help us do exactly that: Revolve. Let’s put it out there: Revolve is where all the cool girls shop. Not only is it a favorite among It Girls, but the retailer also stocks plenty of celebrity-backed brands (think Nicole Richie‘s House of Harlow 1961 and Chrissy Teigen x Revolve) as well as major high-end designers and labels like Marc Jacobs, Rag & Bone and Kenzo. Thankfully for our paychecks, Revolve’s sale section is filled with plenty of marked down finds! Of course, because we like to plan ahead, we found many goodies that are perfect for wearing both today and once the temps don’t call for an army of layers. Think leather jackets, sweater dresses and even a pair of ankle booties we can’t resist. Check out our favorite finds up to 50 percent off! A basic black knit gets an upgrade! This Endless Rose knit is made of a supersoft wool blend and has a rib knit that’s reminiscent of our favorite sweatshirt (just all dressed up). The cutest part, of course, is the glitzy embellished collar, which folds over the neck. Dress up a pair of jeans and booties by teaming them with this knit, or rock it when the weather finally warms up with a leather midiskirt and high heels for date night. See it: Check out the Endless Rose Embellished Neck Sweater (originally $105) now only $63 at Revolve. A great pair of leggings is totally all-season wear, but these are a style staple our closet simply can’t live without! These are made with a blend of cotton, polyester and spandex, so they’re designed to be super stretchy and ready for plenty of movement. The elasticized waist will stay up above your bellybutton, plus the stirrup leg makes these great for both barre and beyond. See it: Check out the Bobi Athleisure Stirrup Legging (originally $70) now only $42 at Revolve. Nothing says “transitional weather” quite like a leather jacket and this one is perfect! The Callie features vegan leather and edgy gunmetal-hued hardware for a truly chic biker babe vibe. It’s not all grit, however — the silhouette is decidedly structured and is designed to play nice with both mid-rise and high-waisted jeans. Score! 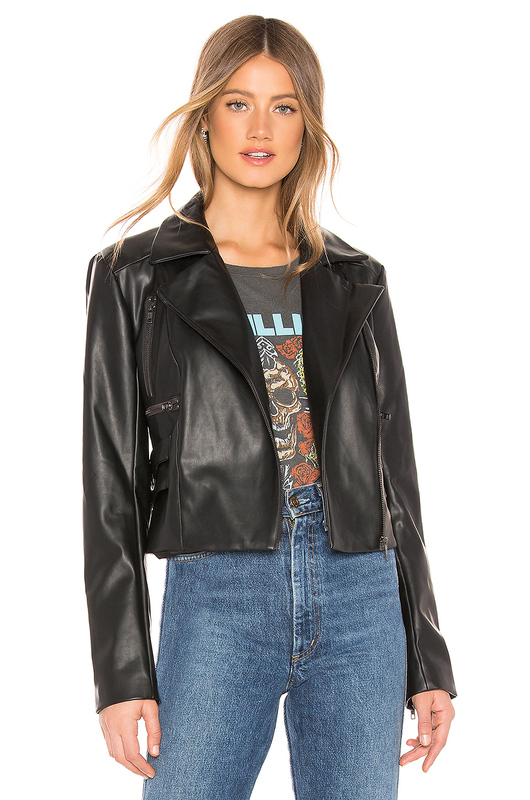 See it: Check out the Lovers + Friends Callie Moto Jacket (originally $198) now only $119! 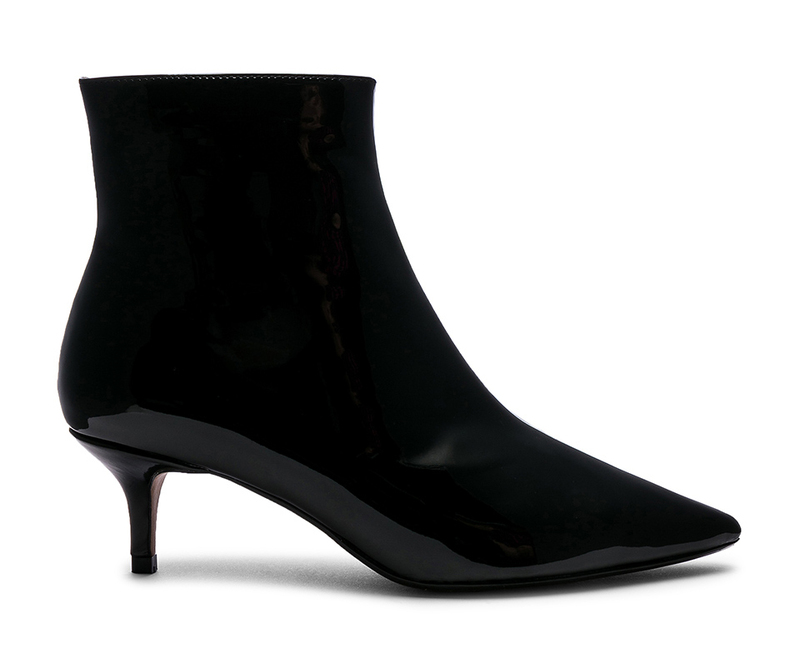 This timeless pair of patent ankle boots will always look chic! The tiny heel (it’s only about 2.25 inches) ensures these will be walkable, yet the pointed toe makes them appropriate for nights out and for work. Pair with skinny jeans in a lighter wash and your favorite knit in the winter, and once it’s not totally freezing, try pairing the white ones with a swingy floral dress. Either way, the adorable kitten heel ankle boots are designed to be a versatile style year-round. See it: Scoop up the Raye Juneau Booties (originally $228) now starting at $73 only at Revolve! Sweaterdresses might not exactly have a reputation for being great date nightwear, but this one is certainly made to steal the show. LA-based label Tularosa is behind the cozy yet flirty dress. The vintage-inspired knit boasts a classic crewneck and relaxed-fit drop shoulders. The cable knit lends a cool bit of style, too. The ever-so-slightly split hem makes the legs look miles long, so pair with either ankle booties or heels in the spring, or keep warm with a pair of tights and slouchy over-the-knee boots. Either way, we’ll win major style points. See it: Check out the Tularosa Austin Sweaterdress (originally $178) now only $75 at Revolve! Not your style? Be sure to check out other sale picks at Revolve, many up to 70 percent off!